Don’t speed in Canada. Especially Ontario. Four vehicles were impounded Saturday for “Street Racing” even though they were by themselves… This can happen in the U.S. too and I’ve had many officers tell me they can impound my vehicle for the speeds I was traveling but they never have – I used to speed way too much before I found racing and started having fun at racetracks instead. They ticket here is generally written for “reckless driving” but in Canada it appears to be called “Street Racing,” which sounds way worse. So last Saturday, the police pulled over 4 cars traveling at near 150 km/h(93 mph) or more and impounded their vehicles. At first I thought they were all racing each other but it turns out they were just moving really fast relative to the speed limit which was 80 km/h (50mph). The first car was an Aston Martin travelling 150 km/h while passing cars on an uphill portion of Airport Road in Mono. Then came a 57-year-old man from North York was also charged with street racing. His driver’s license was suspended for seven days while his vehicle was impounded for a week. Next up was a 45 year old BMW motorcycle traveling 155 km/h down the same stretch of road. His driver’s license was also suspended for seven days and bike was impounded for a week. 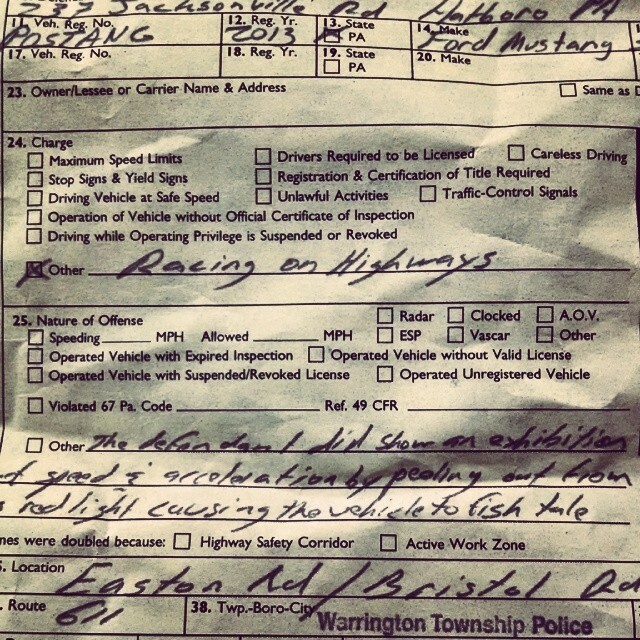 The fourth street racing ticket was BMW M6 traveling 144 km/h. Same result. Street racing and a seven day suspension. Maybe Ontario needs to raise its speed limits. You can find the original news story here.